Boat Rentals of America – Kiwanis Lake offers kayaks and pedal boats for rent; no experience is required. In addition, surrey bike rentals are also available and are perfect for a leisurely ride around Kiwanis Park. At Boat Rentals of America – Tempe Town Lake, everyone in the family can enjoy recreational boating at its best. Select from a variety of watercraft: kayaks, pedal boats, electric boats, stand-up paddleboards and more. Boat Rentals of America – Tempe Town Lake is now offering surrey bike rentals by the hour. Visit their website or call for more details. 72 W. Rio Salado Pkwy. Cholla Trail is the located along the ridge of Camelback Mountain, the highest point in the Phoenix Mountain at 2,704 ft. This trail increases in elevation over a longer distance than the Echo Canyon trail, making the assent to the top less steep. Hikers experience a steady climb with a fairly exposed section of ridge hiking towards the top. The length of this trail is 1.6 miles one way. 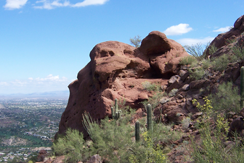 Camelback Mountain’s Echo Canyon is well-known for being one the more difficult, but rewarding, hikes in Phoenix. The trail ascends rapidly over a short distance. Hikers can experience a climb over rocky trails and boulders. The length of this trail is 1.23 miles one way. 5700 N. Echo Canyon Pkwy. The City of Tempe boasts 175 miles of bikeways, including bike lanes, desert trails and canal paths. Go for a ride around Tempe Town Lake, cruise down Mill Avenue or ride some of the trails at Papago Park. Visit the website for more information and a bike map of the city. In November 2015, the League of American Bicyclists (LAB) designated Tempe as a Gold Level Bicycle Friendly Community through 2019. Let’s Ride 22 miles through the Scottsdale Greenbelt, Tempe Town Lake and Phoenix’s Papago Park. This is a full 3-3.5 hour tour complete with stops to learn more about the outdoors, the Indian Bend Wash and the desert. Greenbelt Bike Tours features electric “pedal assist” bike tours in and around Scottsdale. You can pedal our bikes or use the pedal assist option that lets you explore more! We specialize in taking groups of 8-12 people out for an experience to discover parks, paths, mountains, homes as other unique locations and experiences. Our tours are hosted by facilitators who will highlight interesting facts and details along the way with insider information at fun stops and a message of “get out and play.” Tours run 2.5-4.0 hour depending on the tour you choose. All tours are on paths provided by local municipalities and we follow all the rules of the path, parks, and roads. Check out our tours that are offered weekly from different parks and locations in the Scottsdale Greenbelt area. This desert preserve features nearly 10 miles of hiking and biking trails throughout 1,200 acres. It is also home to several attractions and museums. Located in the Phoenix Mountain Preserves, Piestewa Peak has numerous trails for hiking and trail running. At 2,610 ft., it’s the second highest point in the Phoenix Mountains, next to Camelback Mountain. Hundreds of residents and visitors hike Piestewa Peak per week because it offers great views and a great workout. Hikes to the peak usually take anywhere from 25-60 minutes, depending on the experience of the hiker. 2701 E. Squaw Peak Dr.